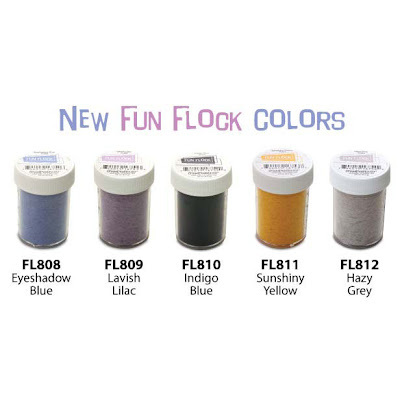 Eyeshadow Blue, Lavish Lilac, Indigo Blue, Sunshiny Yellow, Hazy Gray...these are the new colors that Stampendous has released for their Fun Flock. You know what we say: "It's fun to flock!". Can't you see the Sunshiny Yellow for Easter projects and Lavish Lilac for Mother's Day and other springtime projects? These new colors are now available at eclectic Paperie. We have a small number of "I Want It All" sets and we have plenty available a-la-carte. We also received more popular colors back in stock like Cotton Ball White and Chili Pepper Red. Don't forget to pick up some Sakura Quickie Glue and/or the Tsukineko Essential Glue Pad. Another tip that I saw demonstrated a couple weeks ago was to use your acrylic blocks as a "press" to make sure that your Fun Flock is evenly applied to your images. Hey There Cupcake stamp update: You loved this Stampendous stamp set and told all your friends that we sold out of this exclusive stamp set only available at eclectic Paperie. We are expecting more in early February. You can email info@eclecticpaperie if you would like to be on the Notification List for this item and we will email you to let you know when the item is back in the store. SHIPPING UPDATE: We are currently shipping orders placed on Jan 19th. We were overwhelmed with very heavy traffic and volume of orders during our birthday promotion so you may experience a significant delay with your orders placed during Jan 19th to present.